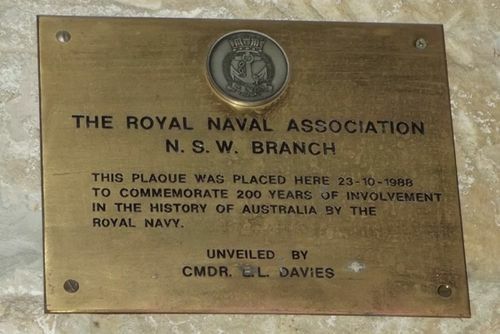 Plaque unveiled in 1988 commemorates 200 years of involvement in the history of Australia by the Royal Navy. The history of the Royal Australian Navy can be traced back to 1788 and the colonisation of Australia by the British. During the period until 1859, vessels of the Royal Navy made frequent trips to the new colonies. In 1859, the Australia Squadron was formed as a separate squadron and remained in Australia until 1913. During the period before Federation, each of the six Australian colonies operated their own colonial naval force; these amalgamated in 1901 as the Commonwealth Naval Forces. The Royal Australian Navy (RAN) was established in 1911, and in 1913 the fleet steamed through Sydney Heads for the first time.